The rogue-like genre certainly is an interesting one. Despite having a pretty well-established list of game mechanics that define what the genre is, the sky’s the limit when it comes to what can be done with those mechanics. From basic RPGs to those that combine elements of platformers and shooters, there are actually quite a few different options that developers can choose to explore. This time around, I took a look at a twin-stick shooter with rogue-like aspects that places heavy emphasis on randomized builds. NeuroVoider originally launched back in late 2016 for PC, Xbox One, and PlayStation 4. After receiving mostly positive reviews on those platforms, it saw a subsequent Nintendo Switch release in 2017 and a surprising PlayStation Vita release in the spring of 2018. For the purposes of this review, I will be focusing on the Vita version. NeuroVoider doesn’t place much of an emphasis on story, but the tutorial gives you as much as you need. You awaken as a brain floating in a test tube, break out of that tube, and acquire a robotic body by choosing from one of three possible classes: Dash, Rampage, or Fortress. Your goal from that point on is to go from level to level, kill everything that moves, destroy the generators scattered throughout, and use newly obtained parts to upgrade your body. Along the way, you’ll encounter several bosses and make your way to the master at the end. Choosing the Dash class grants you the ability to move quickly from place to place, but your HP may be lower than the other two classes. Fortress class bodies are slow-moving, but they make up for that weakness by offering you more HP. I spent the majority of my playtime using the Rampage class since it’s essentially the best of both worlds. 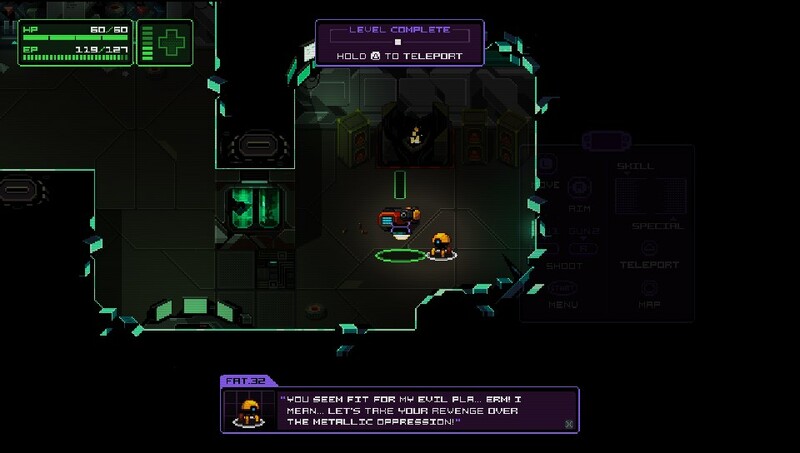 I’ve labeled NeuroVoider as a rogue-like, but the only real defining characteristics that led to that distinction are permadeath and randomized enemies, loot, and level progression. The structure of each level is also procedurally generated. There are between 5-6 different settings that a level can revolve around. After each level there is an “intermission” screen where you are given the choice of three randomly chosen locations. Each of these will have a randomly assigned size, structure, number of “elite” enemies, and varying degrees/quality of dropped loot. The loot itself is what really makes each playthrough unique, as each item that you obtain can be normal, uncommon, rare, or even “glitched”. You use these items to upgrade your base unit’s core, vision components, mobility, and weapons. Each item also comes with its own randomized values for HP, EP, damage dealt, etc. When you first begin a playthrough, you can either choose to generate a brand new body for yourself or use a code from one of your previous playthroughs. It’s all luck of the draw for which parts you will be initially assigned. From there, you will obtain new items as you defeat enemies and gather parts. Depending on which level you choose out of the possible three, the quality of loot that you can obtain will increase or decrease. I found that it’s generally better to start off by choosing stages with low difficulty and medium quality items. Once you upgrade once or twice, then you can start ramping up the difficulty. Keep in mind that once you die, it becomes difficult to reclaim your lost items (though it can be done). The last main point of customization comes in the form of forging new pieces for your body. If you obtain new parts that don’t fit with your desired class/loadout, you can scrap them and use the materials to synthesize new pieces. These new pieces will be generated at random and could be better or worse than what you had before. I’d instead suggest saving the scrap materials to help repair your unit as it becomes damaged. Additionally, if you decide at some point while playing that you’d like to switch classes, you can do so by simply exchanging your current parts for ones that are associated with one of the other two classes. Unfortunately, you can’t mix and match class-specific parts, but that ability would give players an unfair advantage. 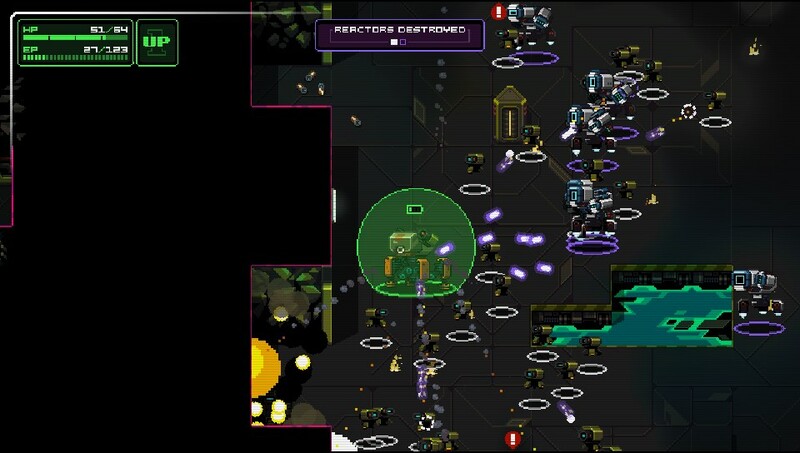 All talk of customization aside, NeuroVoider at its core is a top-down, twin-stick shooter. You use a combination of different guns and energy weapons to mow down robotic enemies before they can do the same to you. Keeping in mind that I’ve only played the PS Vita version, I must say that controlling your unit is easier said than done. While basic movement is pretty fluid, aiming can initially be a bit of a challenge. Something about lining up shots with the right analog stick just feels a bit stiff. This could just be my own perception though and I did get used to it rather quickly. What I didn’t get used to though was the usage of the Vita’s back touchpad. Regardless of loadout, your unit comes equipped with two features, each of which are tied to the back touchpad. Tapping the left side of the pad activates special abilities that you can choose beforehand like HP regeneration or EMP blasts. The right side of the pad is reserved for class-specific abilities like shielding and dashing. The problem with this system is twofold: The left side ability can be used roughly once per level and the right side ability can quickly overheat your unit, causing HP loss. Why is this an issue? Well, if you’re like me, it’s likely that you tend to hold your Vita by resting your fingers on the touchpad. With so few games actually using the touchpad for input, I’ve grown accustomed to simply placing my fingers there. While I attempted to avoid touching the pad while playing, it was a hard habit to break and I found myself wasting my abilities and overheating when I didn’t intend to. This issue won’t exist for other versions, but it’s definitely a point of annoyance on the Vita. Input troubles aside, the rest of the game plays just fine. As a shooter, it’s pretty competent and I enjoyed using a variety of different tactics and loadouts to see which ones worked best. The text is a tad too small to read at times, but that was never a huge issue for me. Perhaps the only other item to be aware of is the lack of multiplayer support on the Vita. If you take a look at the “New Game” screen, you’ll notice that there are four different test tubes, but only the green one is able to be selected. This is because the other three are reserved for other players. If you have the PC, Xbox, PS4, or Switch version of the game, you can select these and play local co-op with other people. Given limitations with the Vita and its low install base, it’s unfortunate but somewhat expected that this would be the case. Still, leaving out the multiplayer feature altogether seems like a huge loss for this version, especially given the positive feedback for this feature in the other versions. We’ve talked a lot about gameplay, so let’s shift gears and talk about the art design now. NeuroVoider is a very dark and futuristic looking game. It’s comprised of really well done pixel art, both for the sprites and the backgrounds. Each level has its own theme and each of them are done quite nicely. From laboratories, to sewers, to ice levels, to what seems like hell itself, there are a good variety of different environments to explore. Keep in mind too that each level will be structured slightly differently, so no two levels will look identical. I have very mixed thoughts when it comes to the music and sound design. On one hand, the soundtrack is done by synthwave artist Dan Terminus and I was very pleased with the tracks that were included. The music overall is very dark and sci-fi sounding so it fits in perfectly with the vibe that the developers were going for. On another positive, the sound effects themselves were pretty nice. I never noticed any issues with these or felt that they were out of place. I did however notice a glaring issue with the background music, namely that it didn’t always play correctly. There were numerous times when I would be in the middle of a level and the background music would simply cut out at random, never to return (until the next level). On none of these occasions did I notice any similarities; they just happened out of nowhere. I’ve seen online that some players of the PC version have reported having no sound at all, but I was unable to verify if my issue was specific to the Vita version or not. Regardless, it is an concern to make a note of. Despite some issues specific to the Vita version, I walked away feeling quite impressed with NeuroVoider and I’m certain that I will continue to play it off and on now that this review is done. Aside from my reservations with the touchpad input and the sound issues, it’s still a very competent shooter and an interesting rogue-like. Since this game relies heavily on trial and error, there really is no cookie-cutter answer for how long this will take you to play. I found that my longest run was a little over an hour, though most of mine fell somewhere between 30-45 minutes. My overall playtime was somewhere in the ballpark of 7-8 hours. If you throw multiplayer into the mix, your times may vary further. In summary, NeuroVoider’s interesting use of randomized loadouts, high replayability, and reasonable price point of $9.99 (for the Vita version) earn it a thumbs up from me. Having said that, I’d forgo playing this on the Vita and spend the extra $5 or so to pick up a version that supports multiplayer. Review Copy provided by the publisher for review purposes.